Most of these are my efforts to implement techniques/recipes from bread guru, Peter Reinhart, in his latest tome Artisan Breads Every Day (btw, my preliminary assessment is the title is misleading and would be correct if followed by “For A Master Baker With Excess Time and Patience”). The fancy, shiny bun in the back is courtesy of Baked in Brooklyn, which has recently opened a mega-space on the north side of Greenwood Cemetery, on 5th Ave. (interior pic below). 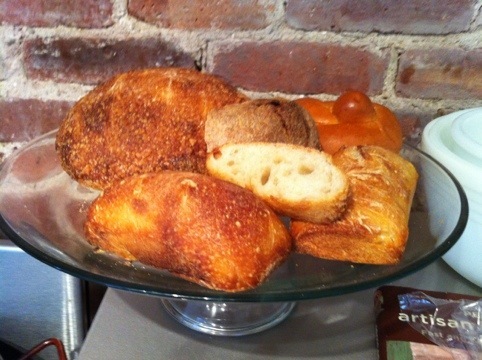 Baked in Brooklyn (which does not yet appear to have its own website) seems to be owned by Aladdin Bakery. This is yet to be confirmed (I tried calling to ask but was told that they can’t give out that information, so I’m waiting for a call back from someone who has the authority to make such disclosures). Also yet to be confirmed is whether there is any connection between Baked in Brooklyn and Baked, based in Red Hook (also Brooklyn). Preliminarily, it appears not. Bread, a loaf for every situation. No wonder bread has been around for thousands of years. There’s plenty of good bread recipes online, Taste of Home magazine website has a good bread section. With a drawback of not staying fresh for long, I’ve seen recipes for Cuban and French bread. The ones I saw were simple enough- flour, water, salt, yeast, and I think some oil. Basic recipes like that are a good place to start experimenting- some fresh herbs come to mind, hot peppers if you’re into spices. My margarine substitute, lightly salted butter, makes a wonderful quick topping on warm bread. For the occasional egg sandwich, a nice fresh warm piece of bread is a natural companion. Oven or bread machine? I don’t recall that question ever being as debated as the old CD vs LP question of old (CDs do sound better). There, I said it! For quite a while now, most fresh bread not from a store comes out of a bread machine, not the oven. I understand there’s so much room for true creativity with an oven. You control the oven temperature and time- the whole process and every step in between. So why bother with a bread machine at all? They are simple to use. Pour ingredients into pan, select bread type then crust color. Start! Machines are compact, easy to use, and there’s recipes all over, your machine will probably come with a small book and some recipes. Built in delay timers will let you program your bread machine like a coffee pot. You can wake up in the morning to some nice hot cinnamon bread. I don’t know for sure, but I believe in the NYC area it would probably cost less to bake with gas. Expect to get some failures. The occasional ‘I thought I put the yeast in’, reversing the yeast and salt measurements, or the ‘I forgot ___!’ moments have been known to happen in ovens and machines. Machines are far more convenient and easy to clean- and can make some nice loaves of bread. On the creativity side, all your loaves will be the same shape, the stand on end loaf, or the ‘pound bread’ loaf. The ‘stand on end’ loaf makes for great sandwich bread or grilled cheese bread, or French bread. 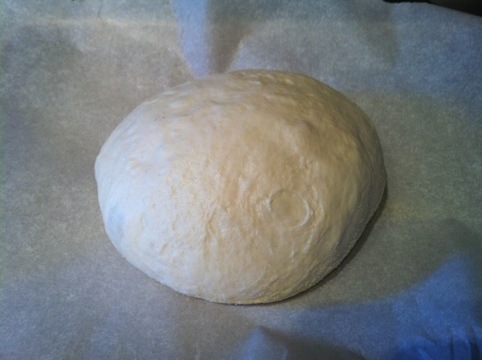 Most machines will let you use them to knead and pre-rise dough which you can then bake in the oven. Machines have a lot going for them. Brilliant! Yes, yes, yes to the love of the bread machine. I only recently stopped working on the machine and switched to the oven. You make me remember the simple beauty of the bread machine and the beautiful simplicity of it. I now am yearning to have it back again. As much as I know I need to knead (it’s good for my patience and the muscles in my lower back), it’s also been a bit stressful trying to get into a regular routine of bread making. 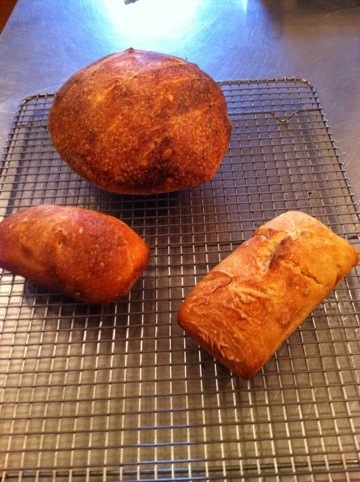 Making bread from scratch and in the oven is both the easiest and the most difficult endeavor I’ve undertaken. Hard to explain but it is both the most straightforward and the most deceptive practice I’ve yet endured. How’s that for clarity? As clear as a pile of unworked dough. Anyway, I’m glad to hear you’re making the most of your machine. What kind do you have? Do you ever struggle with the little hole the paddle puts in the bottom of your loaves? I’m not sure if that’s a universal pitfall of machines, or was unique to my own (which I have since given away though I’m considering getting back in the market and mixing up the handmade loaves with machine productions), at least till I become more practiced in the art of every day bread making. My current machine is a ‘Bread Man’, the same make as my first machine. The hole in the bottom is not such an issue, although some past machines had their own quirks. Sometimes a coating of oil butter, shortening on the paddle helps it side out easily. The coating on some paddles seems to get chipped by adding hard things to the ingredients, and a few pans got scratched up as well. One type of paddle design actually hooks onto the shaft when it spins and seems to work quite well. A slight turn in the opposite direction releases it from the machine. What to do with the bottom slice and hole? The obvious is leave it for last and you may not get to it before a new loaf is waiting. If making grilled cheese go straight to the bottom and cut it off, hole included. Arrange cheese cleverly around the hole so it won’t drip through- same if using butter. 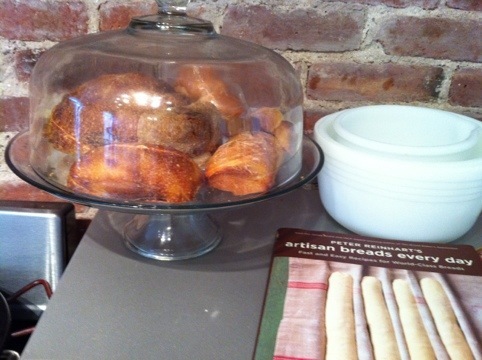 If any of your bread gets stale beyond use, save it in an open container so it stays dry. Put it into a frying pan to soak up the oil you are not going to use any more. Right on with the complex simplicity of it all. Measure all the ingredients carefully, put in machine and push START. Tweak the ingredients (more water, less yeast, &c) and make notes for next time and eventually there’s a perfect loaf- except for the occasional loaf that’s too big for your machine, or a heavier but smaller version of it. Give your perfected recipe to a friend with a different machine and it may be a total disaster. Initially I used measuring cups for the flour, but later switched to a scale and weighed it. The scale is supposed to be more accurate for measuring. I’ve also been trying to use a scale more often, lately. It’s a bit of a challenge at first but I think ultimately will be well worth the effort. Many very serious recipes use the weighted measurements. It’s a good thing to conceptualize it anyway. When you hold a loaf of bread in your hand, the feeling is one of weight, not cups. Good ideas for use of the slice with the hole. The problem with my old machine was that it ended up being a fairly large hole, such that it was more like the four or five middle slices with some evidence of the paddle forever indented on it. I think if I end up in the market for another bread machine (and you’ve got me thinking…), this is one consideration I’ll keep in the forefront of my decision making. I think one of the great things about bread machines is their simplicity. I put ingredients into the pan as I measure which makes for less dirty things to clean up. I am not sure where I found it (book or internet) but I bought a set of English Muffin rings. Basically heat a flat bottom pan, put the rings down, then pour in the ‘thick like heavy pancake batter’ dough in the rings. The rings hold the soft dough in place so you don’t end up with pancakes. 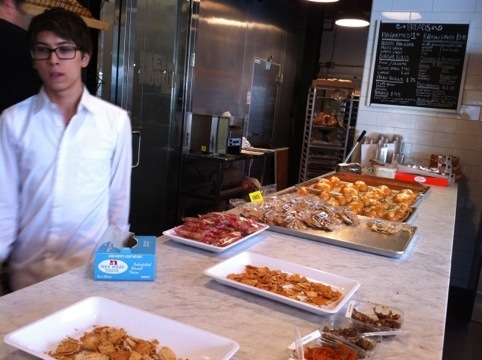 I think the machine was used to knead/ raise the dough. I also remember an English Muffin bread made entirely in the machine. From your description of how large the hole was I am guessing your machine had a horizontal loaf rather than one that looks like it is standing on end? I had one machine with a horizontal loaf (I think it had 2 mixing paddles), but I can’t recall why I didn’t have that machine for long. If I am right about you having a horizontal loaf, you may want to look into the stand up style. You still get a hole, but it’s way at the bottom in the center of the slice(s). If you don’t quite finish the loaf and start slicing from the top you may not even get down to the hole. Horizontal loaf machine’s bread looks like a loaf of commercial sliced bread in the store. It’s a matter of preference, but think of where the paddle will leave a hole in the loaf. Another possibly important thing to watch is how the pan is held in the machine. Some have metal clips and you press the pan straight down and ‘click’ it in place. If these are a little loose, or get loose from use, the pan will move and make banging noises when mixing. I’ve spread clips back out to tighten them and stop the noise, but they could eventually break from bending- mine never broke. Another style, like mine now, you drop the pan in and give it a partial turn to lock it in. While running the rotating paddle keeps the pan secure. I would imagine these could eventually get loose too. One thing about the loose banging pan- I was able to tell from another room whether there was enough water in the batter. If it banged loud it was too dry and needed more water added. Personally, I prefer quiet.